As a homeowner, you’ve dedicated each room in your house to a specific purpose. Obviously, you cook and eat in the kitchen, you sleep in the bedroom, and you get ready for the day or unwind in the evening in the bathroom. But what about fun and recreation? If your home has a game room or man cave, or you’re planning to renovate so there is such a space, Hortons Home Lighting is here to help. We have an outstanding selection of game room lighting, so if you have a pool table, old arcade machines, or a poker table, we can help you find the perfect fixtures. 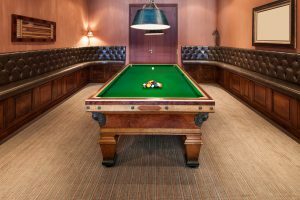 Your rec room is where you go to relax by shooting pool, playing board games with the family, or host a weekly poker night. It’s important to define the space as one of fun and enjoyment, and the lighting goes a long way in achieving that. You don’t want the space to be too bright, but you want there to be enough light that everyone can see while they play. Whether you’re looking for a unique pool table light, or you need ceiling and wall fixtures for the home theater area, we can help you choose the best lights. If you have decor, such as classic movie posters or framed sports jerseys, one of the best ways to display them is with track lighting. We can help you find rails, lights, and accessories that will perfectly highlight your wall decor. For accent lighting, the perfect table lamp can make your bar or seating area feel complete. If you’re looking for new game room or man cave lighting in Chicago, come to Hortons today!